Gov. 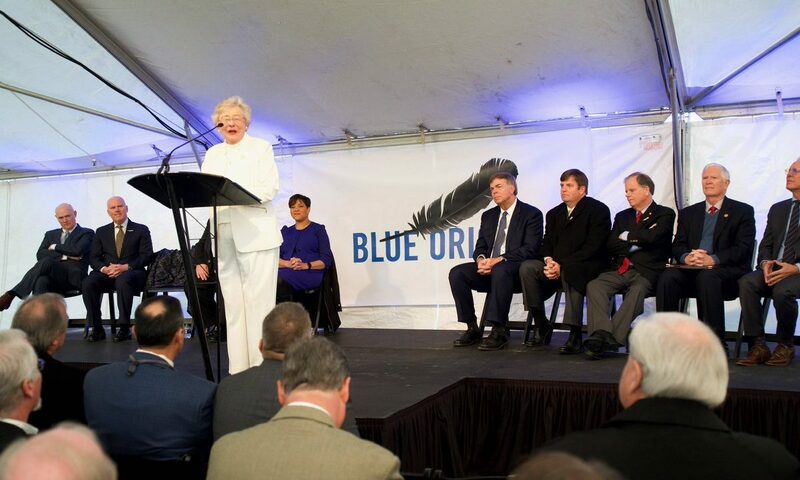 Kay Ivey attended the formal groundbreaking of the Blue Origin rocket engine production facility in Huntsville. Blue Origin was selected by United Launch Alliance (ULA) in September 2018 to supply their next-generation Blue Engine 4, or BE-4, for the first stage of ULA’s Vulcan Centaur Rocket. It will also launch Blue Origin’s own rocket. U.S. Sen. Doug Jones, D-Alabama, praised Sen. Richard Shelby, R-Alabama. “He could not be here today, but I know the work that he has done on this project,” Jones said. “Jones said that growing up in the fifties and sixties he dreamed of going into space like John Glen and Allen Shepherd. Jones praised the work that ULA does at its rocket factory in Decatur and said that a lot of people did not realize the work that ULA does. Since NASA retired the space shuttles with no replacement, the United States has not sent astronauts into space. The U.S. astronauts have been riding with the Russian space agency. The United Launch Alliance’s American built rockets in Decatur have been relying on Russian built rocket engines. The BE-4 engines being built in Huntsville changes all of that. Brooks said that Blue Origin has 1500 employees and is headquartered in Kent, Washington. Brooks said that while Washington is nice, the company should move its headquarters to the Tennessee Valley. “The United States is in the Space Race again,” Nicole Jones added. Blue Origin’s BE-4 engine is the most powerful liquefied natural gas (LNG) fueled rocket engine ever developed. Using an oxygen-rich staged combustion cycle, BE-4 is capable of producing 2,447 kN (550,000 lbf) thrust with deep throttle capability. BE-4 is currently undergoing full-scale engine development testing in company facilities in Van Horn, Texas. Construction of the rocket factory in Huntsville will allow full rate engine production. The BE-4 is America’s next rocket engine and is made for both commercial and government missions. The production of this engine would end the nation’s dependence on Russia for access to space for critical national security space systems. The plant will be built on 46 acres at the corner of Explorer Boulevard and Pegasus Drive in Cummings Research Park. The project will produce more than 300 new jobs for Huntsville. The Huntsville manufacturing plant is expected to open in 2020, and the first flight test of the new engine is expected in 2021. Blue Origin’s rocket manufacturing plant is the latest exciting addition to Huntsville’s Cummings Research Park, which is the second largest research park in the United States and fourth largest in the world. “ULA’s Atlas and Delta rockets are the most successful space launch vehicles in history, having launched more than 130 missions with 100 percent mission success.” ULA’s Bruno added. Students from Bob Jones High School, New Century High School, and Sparkman High School attended the Blue Origin’s groundbreaking in Huntsville to display projects they have been working on for the past year. The engineering classes at the three local high schools are participating in a collaboration project called DreamUp. Each class is creating a payload that will launch on a future Blue Origin New Shepard mission. The projects will be enclosed in small cubesats weighing less than 1.1 pounds; one will test if voltage is affected by microgravity using a Raspberry Pi, and another will test the electrical current created by heat transfer in space. The students have been working on their projects since Spring 2018, submitting monthly reports to the technical team at NanoRacks. Their work is being done in collaboration with DreamUp PBC, the leading provider of space-based educational opportunities, and NanoRacks, LLC, the world’s leading commercial space station company. Blue Origin is owned by multi-billionaire Amazon founder Jeff Bezos.